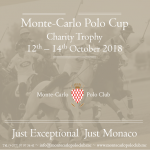 Annually, this event attracts guests including ministers, ambassadors and foreign dignitaries, distinguished guests of sponsors, Patron, Committee and members of the Monte-Carlo Polo Club, prominent local businessmen/women, socialites and celebrities. Proudly announcing the 6th edition, 2018, will take place October 13-15th 2018. Venue details to follow and program as below. Save the date, tickets available now!